When caffeine enters the brain, it affects nerve centers that are responsible for neurological reward systems. In essence, caffeine makes you feel good and the releasing of dopamine in the prefrontal cortex of your mind reinforces the behavior, consequently making you want to have more caffeine in the future. Maurice Mikkers has a passion for both science and photography. A few years ago when he was on strong pain medication, he got the idea to combine his passions and photograph pain killers under the microscope. He then decided to photograph caffeine - the world's most addictive and widely used drug. Caffeine is a widely used natural substance that is also an additive. The image below if of the first try of crystallizing 100% caffeine powder. The caffeine powder was added to de-mineralized water and heated in a water bath to 212° F. After this first step, large drops of the sample were placed on a microscope slide, within 45 minutes the drops were fully crystallized and ready for photographing under a polarizing microscope using a Berek compensating filter. 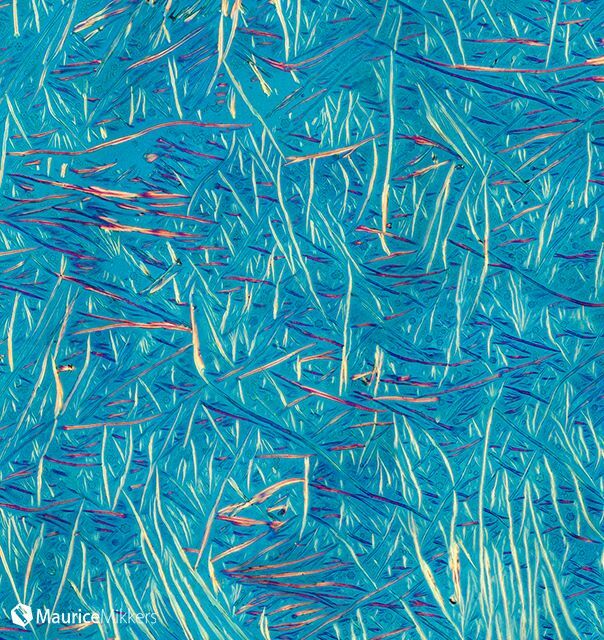 Caffeine crystals under a polarizing microscope with Berek filter. The image shown above is a shot that was captured and made out of 25+ images in a comprehensive grid covering only part of the sample using a Canon ESO 5D Mark III 22 megapixel camera. The images were later stitched together in digital post production. Thank you to Maurice for sharing his microcopy images with Microscope World. 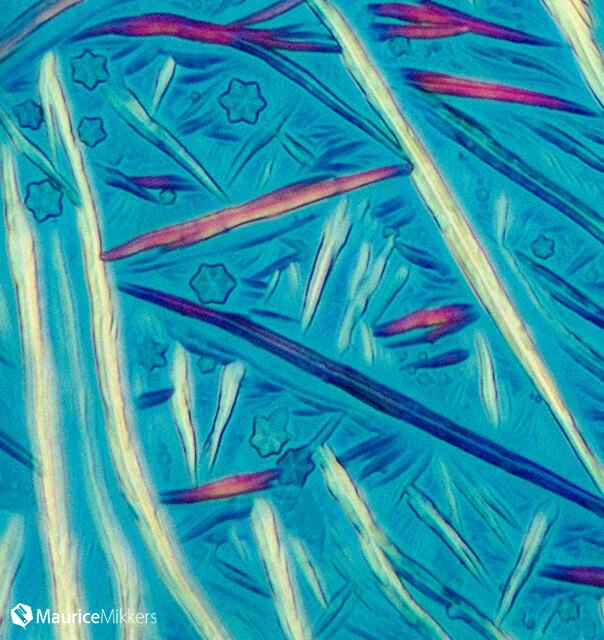 He has captured other images of drugs and medicine under the microscope and you can view more images by Maurice Mikkers here.